This collection of materials is derived from my years of research in the Andes, primarily in the southern Andean department of Ayacucho and specifically in the village of Chuschi, Peru and the surrounding region of the River Pampas Valley in the province of Cangallo. I began research for an undergraduate honors' thesis in 1967 and the earliest images are from that date and continue through 2002. 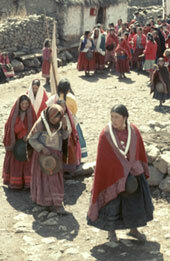 Included in this collection are approximately 1500 photographs, thirteen songs, my ethnography, To Defend Ourselves: Ecology and Ritual in an Andean Village, as well as selected publications. ©2005 Cornell University Library | Copyright info | Credits | Questions? Contact dcaps at cornell dot edu. Made available through the 2004 Faculty Grants for Digital Library Collections: Advancing E-Scholarship program.